Spring has sprung here at the Frazier Museum! Looking for a new location for your spring cocktail party? Look no further than our Gateway Garden! A secluded garden including a mezzanine overlooking Main Street, our Gateway Garden boasts landscaping throughout, all designed by Kentucky native John Carloftis. This picturesque venue is perfect for cocktail parties, intimate brunches or just a fun evening with friends and family! Don’t wait, book our Gateway Garden for your next event today! It’s no secret how much we love bourbon here at the Frazier… but how can that be incorporated into your next event? Look no further than our third floor Order of the Writ room! Complete with access to our Spirits of Kentucky ® exhibit, guests can wander through the different elements of bourbon and how it translates back to Kentucky, even stopping in our Bottle Hallway featuring every bourbon currently in production in Kentucky. If guests want the full Frazier experience, the Frazier is host to Bourbon Ambassadors that are able to give guided tours of the exhibit, ending in a bourbon tasting. This tasting educates guests on the subtleties and differences of bourbon varieties by sampling three distinctly different bourbon products. Looking for a unique area to host your next cocktail reception? Look no further! Our Order of the Writ room fills the unique factor and our Bourbon Ambassadors are ready to give guests an experience they won’t forget! Holiday parties are one of the most exciting parts of December! The holiday season brings parties, decorations, and so much more. This past season, the Frazier Museum decorated with a Kentucky Christmas theme. Guests were able to enjoy bourbon barrel décor, garland, and live trees galore throughout all three floors of the Museum. It’s never too early to start planning your 2019 Holiday party! Whether you are hosting a daytime luncheon or a nighttime cocktail party in our Order of the Writ room, there are plenty of options to treat your guests to a great time. Inquire today about hosting your holiday party here at the Frazier! Living in Louisville certainly has its perks, including the largest annual fireworks show in North America. Every year, Thunder Over Louisville is the official start to Kentucky Derby season. What better way to embrace one of Kentucky’s brightest events than hosting your Thunder watch party at the Frazier Kentucky History Museum? Located conveniently on Main Street, our rooftop garden boasts breathtaking views of the Ohio River that are second to none. Before the show, you are able to host your guests in our fourth floor loft. Once the fireworks are ready to begin, your guests can travel upstairs and enjoy a private view of one of the greatest firework shows available. Interested in hosting guests during Thunder Over Louisville but want a unique setting without the crowd? Don’t wait, book today! Normally when people post on Throwback Thursdays, they don’t mean a throwback all the way to the 1920s but that is what we are doing! Our newly remodeled Speakeasy takes you all the way back to Prohibition times but it leaves us wondering how these infamous clubs got their start. During the Prohibition Era, when alcohol was illegal, Kentuckians certainly did not want to give up their liquor. Speakeasies became secret hideaways for people to gather and drink. These hideaways went to the extremes, having secret entrances in bookshelves, underground caves and even a trap door. Due to these top secret hideaways, notorious gangsters were also known to be regular guests in these places, including Al Capone. Sticking to the history of Kentucky, the Frazier Kentucky History Museum has newly remodeled our Speakeasy, including a built in bar and secret entrance. Our Speakeasy is now available to rent for event space! Thinking of a party with a unique setting? Interested in a location for your rehearsal dinner or cocktail hour that your guests certainly won’t forget? Look no further! 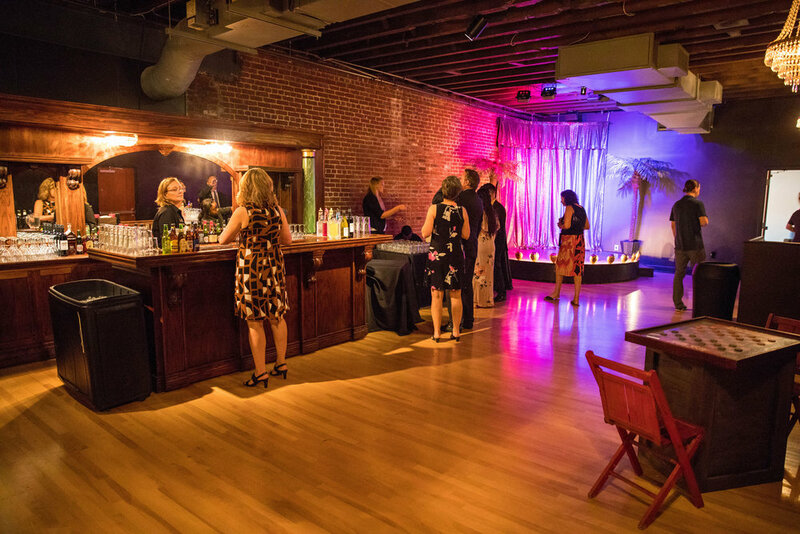 With a Speakeasy rental, the Spirits of Kentucky gallery access is yours to enjoy as well. Call for more information or to schedule a tour to see for yourself! Cory Leonardo, owner of PartyZone Productions, shared some knowledge on DJ-ing and his company. Starting PartyZone Productions nearly 30 years ago, Cory has seen and done it all! PartyZone is seasoned in weddings and events, we hope Cory's advice will answer a lot of your questions regarding DJ's! How long have you been in the entertainment business? This question will date me, ha! When I was in high school we had a 7th period dance and they needed a DJ on the cheap. Needless to say I gathered ALL of the music I had and that started it all. That was 28 years ago. I can say that DJ-ing has taken me all over the United States and allowed me to do and see things that a lot of people dream of. I’ve spent six months on the road with George Strait, opened for Robin Meade and Kellie Pickler, destination weddings all over the nation, nite clubs all over the state, emcee for Hawaiian Tropic for 5 different states and so much more. There’s no other feeling in the world than that tickle right before you go on stage. I’ve never really worked a day in my life. What is your favorite thing about DJ’ing a wedding or event? One of my favorite things about a wedding is to see a bride and groom on the dance floor surrounded by their friends and family and they’re having the time of their lives. The release of stress from all of the planning the day itself and they find themselves truly enjoying all of the celebration and fruits of their labor. DJ-ing corporate events- whether that be a holiday party, fund raiser, trade show or something else is always different. You really need to be in touch what that client’s goals. Sometimes a dance party isn’t exactly what they want. They just want people feeling the “vibe”. Sometimes they want just background music etc. We produced background for a corporate client trade show. They wanted people happy, they wanted energy in the room, they wanted people to stick around and talk to the vendors in the room. We made it happen. We had vendors dancing with future clients in the aisles and making sales. We were invited back to take part in their next trade show in Atlanta, GA.
What popular trends are you seeing right now? Trends in events are all over the place. No two events are the same. It really depends on the taste of the Bride and Groom or theme of the event. Wedding backdrops - They’ve always been there in the since of an arbor or something simple. Now we’re seeing a lot of draping and specialized lighting. Fabrics - Room draping, entrances, dance floor, ceiling swags etc. Transforming your room from what it looks like to something totally custom and beautiful. Uplighting - New technology in the LED industry allows us to make any color imaginable. Muted colors seem to be the hot thing this season. Champagne, Blush and Tiffany Blue’s seem to the HOT colors. Cake Lighting - Simple little lighting on the cake makes it really pop and become a centerpiece for the room. Cake Mapping - Disney really marketed this well. Their Tinkerbell video flying to the top of the cake, touching it and a waterfall comes down the cake. Several other animated segments to follow. This allows the Bride and Groom several options. Slideshows, Custom monograms or animations on the cake just for their wedding. They can use a larger fake cake stand in and they have a small cake behind to cut and feed each other. Then the guests can have cupcakes, pie, cookies or even a sheet cake from the back for much less. Fair warning for all brides that want this process. This isn’t just a projector shining on to a cake. It’s a fairly sophisticated program that takes into account angles from the projector and each individual layer. Furniture - We’ve seen everything from elegant white leather couches to a high back chairs for the sweet heart tables. If someone is not expecting a lot of dancing at their event, do you still recommend having a DJ? A DJ is so much more than someone playing music. They’re the central point for all of the vendors. Making basic announcements, introducing special speakers, moving people from one area to another etc. They really control the room. A good DJ can do this without ever being seen. What sets you apart from other DJ’s in the Louisville Area? I get asked this question by clients a lot. When I started PartyZone Productions I asked myself, do I want to be a cheesy DJ, wear the hats, get on the floor and be the center of attention? Or, do I want to handle the event with class, style and elegance? Provide professional equipment and services and be able to still throw the party of a lifetime. I chose the later. What also makes us different than most other services is that this is all I do. We have an office in Bluegrass Industrial Park where we can meet and discuss all of your details. We have tons of equipment for any option or theme an event may need. I also invest in our people. We do training sessions and travel to national trade shows to experience and learn. What is your best advice for someone who is looking for a DJ? Let’s face it your DJ is the one service you’re going to hire that can truly MAKE OR BREAK your entire reception. Ask your venue for a referral. They see the good, bad and ugly every weekend. Make sure that your DJ has good reviews. Search on www.weddingwire.com, www.theknot.com, www.yelp.com, and www.google.com. Ask for referrals from friends or even the other services you’ve already hired. Ask to see pictures of their set up. Who wants plan this beautiful day to show up and see cables hanging all over the place, a sloppy table and someone sitting behind a table? What do they wear? All of our guys wear suits. We were hired not to long ago where we provided lighting only. The DJ they hired from Facebook was wearing a Budweiser T-shirt and Jeans. If your DJ takes themselves and your event serious enough they’ll be insured and registered with the state. For more information, visit their website today! Even on a rainy day, our rooftop provided the perfect photo op for a perfect proposal! Andrew wanted to make sure Ashley was completely surprised; clearly he did a great job! Thank you Ashley and Andrew for sharing your adorable photos taken by Abby Ott. We wish Andrew and Ashley all the best! We fell in love with Katelyn & Clay's wedding! The simple yet stunning decor was beautiful and the family style dinner was a fun twist. We wish them all the happiness as they spend the rest of their lives together! Check out these amazing photos taken by Bethaney Danné Photography . We asked Jill Elizabeth, owner and creator of J. Elizabeth Designs, to share her insight and expertise on wedding flowers. Jill has been in the industry for nearly 20 years and has done her fair share of weddings! We hope her advice eases the stress and confusion of picking out your wedding flowers! What are some popular trends/ requests you have been noticing lately? One word- greenery. It's making a come back in a big way. For a bride who has no idea where to begin when ordering flowers, what do you suggest? Go to a professional. Start with the basics for your wedding- location, time of day, season, and colors for the wedding. Each of these components contribute to the overall look for a wedding. Look at photos of the florists own work and the bride should bring what inspires her; whether it be photos, Pinterest, magazines, or even paint chips. The designer can then blend all ideas together cohesively. What is important information you think brides should know when inquiring/ planning their flowers for their wedding? Flowers can be a "Big Ticket" item for a wedding- dependent upon their importance. Every wedding is unique so therefore pricing for each wedding is equally unique. Every wedding can be beautiful on any budget. Do you have a ballpark average of what flowers for a wedding cost? Between 5%-15% of the overall wedding budget, but we have had weddings for less than 5% and some for more than 15%. How did you get into the floral business? While I was in college I worked for 2 wonderful and well established florists in Louisville. After graduation I worked for 2 other florists- one of which we almost purchased before deciding to start our own business. After years of establishing the company we had the opportunity to purchase another flower shop and blend their company into ours. What is your favorite thing about doing flowers for people’s big day? It's the happiest day of their lives and being a part of such a joyful moment is a blessing. In your opinion, what sets you apart from other florists? Our staff and wholesaler. My mother and I started the company in 2003 and have built it from the ground up. We would not be here without the people that have come along beside us. The team(s) we have ad through the years believe in the company as much as we do. They are talented in their own ways- from design, to organization, to setup and delivery- there is nothing they can not do. We would not be here without the sales team at Dreisbach wholesale- they take care of us so that we can take care of our clients. When do you recommend people reach out to florists to figure out their floral arrangements for their wedding? As soon as they have a date. It's never too late. We have even had clients who have booked us before they have a date. We just put their names on the potential dates and wait for the exact one once it is selected. For more information or to schedule an appointment, visit J. Elizabeth Design's website!